Unexploded Bomb in Soldier's Body: Could Docs Save Him? Thursday, March 16, 2006, was a beautiful sunny day in Paktika Province, eastern Afghanistan. It borders a lawless region of Pakistan that is home to some al Qaeda and Taliban forces. Snow in the mountain passes along the border had melted giving them access again to Afghanistan where they came looking for American soldiers. They soon found them. At dawn, the 10th Mountain Division's Alpha Company headed out on a mission. Lt. Billy Mariani, the unit commander, noticed something about his troops. Click here to watch the full story on "20/20." "There was definitely a sense of uneasiness. There was an air about them of, you know, maybe something was going to happen," he said. The convoy included some two dozen 10th Mountain Division soldiers mounted in five armored Humvees and a handful of Afghan National Army troops riding in a pickup truck. Their mission was to visit a remote village to meet the tribal elders. No roads existed in this no-man's land and they had to drive through waddis, dry narrow river beds with high, dangerous ground on either side. Four hours into the drive and just miles from the village, gunfire broke out. They'd been ambushed from above. Twenty-three-year-old Pvt. Channing Moss, the gunner, said it sounded like rattling spoons. Then came the big guns. Volleys of rocket-propelled grenades rained down. The Afghan National Army pickup exploded. Two of the Afghan soldiers died. One RPG skidded past Lt. Mariani's vehicle. All of the vehicles had to quickly get out of the "kill zone." But before they could get to safety, three rockets hit Pvt. Moss' Humvee. Staff Sgt. Eric Wynn, 33, the soldier in the front passenger seat, felt one slice through his face. Moss remembers the truck practically lift up. He was thrown up against the Humvee and then moved to return fire. "I smelled something smoking and I looked down ... and I was smoking," he said. View photos of Moss, Wynn and others here. Wynn turned to tell Moss where to fire and saw the tail fins of the RPG sticking out of Moss' side. Roughly the length of a baseball bat, an RPG travels at the speed of a bullet. At the front end is the warhead -- a large grenade. The detonator and fuel are contained in the shaft. On the back are its fins, pieces of metal that stick out like legs on a camera tripod. The RPG is the weapon of choice for many of the world's guerillas. Luckily for Moss, the company medic Spc. Jared Angell, 23, who the soldiers call "Doc," was in his Humvee. With Alpha company still under fire, it would have been nearly impossible for Angell to get to Moss in time if he hadn't been close by. The RPG that had plowed into Moss' lower abdomen stretched from one hip to the other. If the RPG went off, it would kill everyone within 30 feet of him. Yet Angell stayed close, bandaging his wounds and stabilizing the weapon so that movement wouldn't cause it to explode. Moss was still fully conscious, so Angell ordered him to not look down at the injury. He didn't want Moss to panic. "I'm gonna do everything I can," Angell said to Moss. "You keep fighting with me and I'll keep fighting with you." Wynn held his wounded face together with a bandage and reported their casualties over the radio while he also reached for Moss' hand. "He was squeezing my hand ... making sure I was staying alive," Moss said. Reports of injuries had been radioed to the medical evacuation helicopter (MEDEVAC) base in Salerno, Afghanistan -- minus one crucial piece of information. "We didn't tell them that, you know, Moss had live ordnance in him," Mariani said, "because there was that possibility that, you know, they might not want to transport him with live ordnance in him." Preparations began for the rescue mission. But first the Blackhawk crew had to wait for clearance from commanders because the area was "hot" -- the battle was still raging. For MEDEVAC crew chief SSG Christian Roberts, it was a very long 15 minutes. "When you know you have wounded people out there that are waiting for you to come pick them up, it seems like an eternity," he said. The firefight died down and Mariani went over to check on Moss. Even though he was stunned by the fins sticking out of him, Mariani said, "I grabbed his hand and I just said, 'Hey, buddy, we're gonna get you out of here.'" "Doc" continued working frantically to stabilize Moss even though the RPG was a danger to everyone around Moss. Angell knew Moss' only chance for survival was to get out of there and to a hospital quickly. "I constantly was looking at my watch, saying, you know, 'When is the bird gonna get here, when is the bird gonna get here,'" medic Doc Angell said. When Lt. Mariani pulled "Doc" aside to ask him if he thought Moss would make it, he could only shake his head no. If Pvt. Moss didn't survive, his wife, six months pregnant with their second child, would lose her husband and his daughter Yuliana would lose her father. But just as Moss felt he would die, he heard the choppers. An Apache helicopter escorted the MEDEVAC chopper in case there was more gunfire. Spc. Collier, the flight medic, quickly realized what they faced with Pvt Moss. "I see a metal object protruding out, and there are fins on it, and I am like, 'This looks like this guy got hit with something, and it's stuck in him, and it didn't blow up,'" he said. Army policy states that they are not supposed to transport soldiers in Moss' condition. The risk of catastrophic loss is too great -- four MEDEVAC crew members, three wounded soldiers and a helicopter could all be blown out of the sky. But they also knew if they didn't take Moss, he would die. Pilot CW2 Jorge Correa conferred with his soldiers: "I asked my crew, you know, 'Are you guys comfortable with this?'" he said. "Because I wasn't gonna put my crew in jeopardy if they weren't comfortable with it." The crew quickly decided to take the risk. Co-pilot Jeremy Smith recalled the tense moment. "We all said, 'Yeah, let's get him on board and let's get outta here,'" he said. As crew chief Christian Roberts said, "We are not gonna leave a U.S. soldier to die in the middle of Afghanistan." The MEDEVAC helicopter flew over mountains fully loaded with Moss and three other wounded, racing the clock. Moss' best chance of survival was to get advanced medical care within one hour of his injury. Trauma surgeons call it the "golden hour." But Moss' had already ended. Radio dispatches let the trauma team know that they had one critical patient coming whose blood pressure was dropping and heart rate was dangerously high. But reports of the true nature of Moss' injury had not reached the closest medical facility at the Orgun-E base -- a former goat shed transformed into a rough field hospital. They were told it was "shrapnel injury." The aid station had two doctors, Maj. John Oh, a general surgeon, and Maj. Kevin Kirk, an orthopedic surgeon. At this point it wasn't clear which Moss needed most -- a surgical team or a bomb squad. It was only when Oh started cutting away all the bandages that "Doc" Angell had delicately wrapped around the RPG that he saw what they were facing. "It had fins coming out of the left side of his body and had a big bulge in the front of his right thigh," Kirk said. Still conscious, Moss remembers the faces dropping in shock as they took in the sight. Incredibly, both Oh and Kirk had drilled for this exact scenario, because the Army has a protocol to handle patients with unexploded ordnance in them. "You're actually not supposed to bring them into an aid station," Oh said. "And actually, he wasn't supposed to be flown with the other patients either." According to the "War Surgery Manual," Moss should have been placed far away from other patients and operated on last. If procedure had been followed, Moss would likely have bled to death, but the doctors felt compelled to save him. Then Pvt. Moss had another life-saving break -- Staff Sgt. Dan Brown, the explosives expert who spends his time disposing of bombs and captured weapons, was on the base. In his spare time, Brown had been watching an episode of ABC's "Grey's Anatomy" about a patient with an unexploded grenade in him. In that story, the bomb technician is blown up. Brown was about to play a leading role in his own non-fiction drama. Brown, shocked to see that Moss was still alive, confirmed that they were dealing with an RPG. Moss' life hung on whether or not they would remove the rocket. Brown explained the different scenarios of what could happen. The worst case was that they would all become "pink mist" -- everyone in the room would be killed. But to identify how much explosive power they were facing, they needed an x-ray to determine whether the RPG's warhead was inside Moss. Their notoriously temperamental x-ray machine malfunctioned, and it wasn't until the third attempt that they got a decent image. The doctors and Brown were relieved by what they didn't see. The deadliest part of the RPG -- the main explosive charge -- was not in Moss. But their relief diminished when Brown explained to the surgeons that it would still have enough force to kill Moss and destroy their hands. At that point, Oh ordered everyone except the critical staff out of the aid station, the two doctors and three surgical staff remained. They all knew the risk they faced. "I looked everybody in the eye and said, 'You guys understand what's going on here, right?' And I knew everybody heard me, but nobody said anything. They just kept doing their jobs," he said. Oh told them it was okay to leave -- but nobody did. With no words exchanged, each had decided to risk their life to save Moss. Extreme blood loss had caused his heart to stop. Unable to do chest compressions for fear of setting off the round, they gave him epinephrine. His heart soon restarted and they could finally operate to remove the RPG. Sgt. Brown used an unusual instrument to gently remove the RPG's tail fins -- a hacksaw. The surgeons reached inside Moss, steadying the still lethal rocket, inches from the soldier's beating heart. They then gently eased the rocket out, with the detonator aimed at Brown's flak vest. Brown quickly walked out of the aid station to a bunker and detonated it. The sound of the explosion thundered through the base. As the surgeons closed up Moss' incisions, Sgt. Brown sat down outside to collect himself. Finally, the impact of the drama hit him. "I started shaking. I just sat there. I knew I did everything I could to help him live. And that was very, very intense for me after the fact," he said. In a matter of days, after stops at hospitals in Afghanistan and Germany, Pvt. 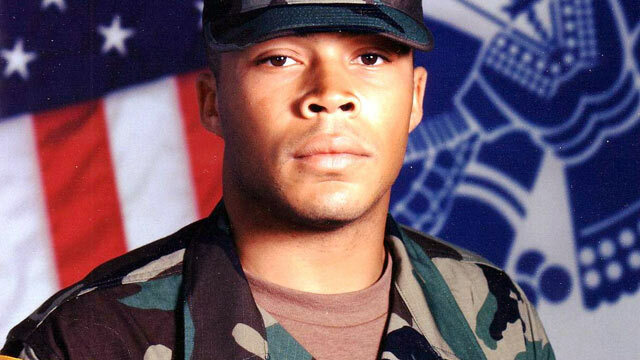 Moss was rushed to Walter Reed Army Medical Center in Washington, DC. There his wife, Lorena, saw him for the first time and it was almost too much to bear. "He looked very vulnerable. I went in, and ... I walked away. I couldn't stay in the room. I broke down outside in the hallway," she said. Moss' pelvis was shattered, his internal organs were severely damaged and he was unable to walk. For Moss, this was another challenge in a lifetime of obstacles. Raised by family friends after a tough childhood, he had become a high school football standout, got into college, got married and had a family. As broken as Moss' body was, he focused from the very start on recovery. He said he didn't need a doctor to tell him if he'd be able to walk again. "I told [the doctor] ... I could feel my feet, I'm going to walk again. Told him just like that," Moss said. For his wounds in combat, Pvt. Moss had a Purple Heart coming. But he wanted to wait. It was important for him to be able to stand to receive it. He underwent four major surgeries followed by intense physical therapy. Pvt. Moss' recovery was steady … moving from a wheelchair to a walker to a cane. "I wanted to walk and get my medal, I wanted to stand up, to let them know I fought hard to get where I came from," Moss said. "They say 'Army Strong' [and] I wanted to be an example of that, and I was. So I stood up, I walked over there and got my medal." Moss returned home to his family and the new baby daughter, Ariana, he thought he would never meet. Despite the aches and pains, he is grateful for the risks so many soldiers took that day. "I was given a second chance. And to whom much is given ... much is expected. So a lot is expected of me," Moss said. For Sgt. Brown, there was never a question about taking the gamble. "He was American, he was a solider, he was a brother and he was one of us. And there was nothing gonna stop us from doing what we knew what we had to do … We knew we did right. In that screwed up world we did something right," Brown said. To learn what Moss and the men who saved him are doing today, click here. +Channing Moss and the Men Who Saved Him: Where Are They Now?